Not much news in terms of the Arsenal squad; Gabriel remains out with his hamstring injury, which isn't unexpected. He is, however, back in training, so there's some good news on that front. Aside from that, the players who were rotated out for the cup tie at the weekend should be rotated straight back in. It all seems pretty obvious to me. Perhaps the most worrying thing, however, is the fact that Mesut Ozil, Olivier Giroud, and Joel Campbell are each one yellow card away from an accumulation ban. Predicted XI: Cech, Bellerin, Mertesacker, Koscielny, Monreal, Coquelin, Ramsey, Alexis, Walcott, Ozil, Giroud. Barcelona should have their strongest possible XI available for this one, with the only injury absentee being Rafinha, who needed knee surgery. Marc Andre ter Stegen usually gets the call in between the sticks for Champions League matches, while Claudio Bravo starts La Liga games. Predicted XI: ter Stegen, Alves, Pique, Mascherano, Alba, Rakitic, Busquets, Iniesta, Suarez, Neymar, Messi. A 0-0 draw at home against Championship Hull City is not the ideal way to go into a match against arguably the best team in the world, but football is a funny old game sometimes. Recall that Arsenal's 2-1 win over Barcelona in 2011 came a week and a half after the Gunners blew a 4-0 lead to draw at Newcastle. The magnitude of a visit from Barcelona is such that form almost goes out the window. Arsenal's form has not been poor; their loss to Chelsea is their only loss since Boxing Day. It's just that they're not winning as many games as they should. Aside from the one loss, Arsenal have six wins and four draws across all competitions and three of those draws were scoreless. The worry is, aside from the magical game against Leicester, Arsenal have been firing blanks when they need goals the most. And, well, what can you say about Barcelona? They haven't lost since October 3, a string of 24 wins and six draws across all competitions. Their last draw came 1-1 against Valencia in the second leg of the Copa Del Rey semi-final. Of course, they had won the first leg 7-0, so it was all really academic. The draw snapped a 10-game winning streak, which dates back to a 0-0 draw with Espanyol on January 2. Barcelona are sitting pretty at the top of the La Liga table, eight points clear of second place Atletico. Arsenal and Barcelona have met on seven previous occasions; Arsenal have one win, Barcelona have four, and two matches ended drawn. 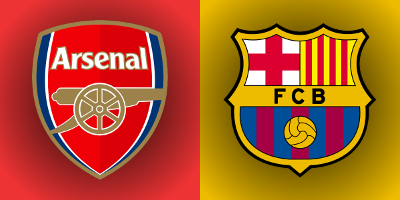 The clubs first met in the 1999 first group stage, where Arsenal earned a 1-1 draw at Camp Nou before losing 4-2 in the return match, which was played at Wembley. They did not meet again until the 2006 final, which Barcelona won 2-1. The clubs met again in the 2010 quarterfinals; Arsenal came back from 2-0 down to draw the first leg at the Emirates, but Leo Messi scored four in the second leg, and Barcelona won 6-3 on aggregate. One year later, the clubs met in the round of 16, where Arsenal won at home 2-1 before losing the second leg 3-1 under controversial circumstances. Overall, Arsenal have a losing record against Spanish opposition; they've won 10, lost 12, and drawn seven of their 29 matches against teams from Spain. In 64 previous Barcelona matches against English opposition, the Catalan giants have 28 wins, 17 losses, and 19 draws. The match officials are from Turkey; the referee is Cuneyt Cakir. Cakir has worked only one Arsenal match in his career to this point, the 2-0 win over Bayern Munich on matchday three. He has taken charge of five previous Barcelona matches, including last year's final, a 3-1 win over Juventus. Barcelona drew the first two of the five matches with Cakir, including a 1-1 with Rubin Kazan in the 2010 group stage and a 2-2 draw with Chelsea in the 2012 semifinal that saw the Blues through to the final. They have won three straight with Cakir as of right now, beating Benfica in the 2012 group stage, Juventus in last year's final, and Roma 6-1 on this season's matchday five. Cakir has refereed some prestigious matches over the course of his career, including the 2012 FIFA Club World Cup Final, which saw Corinthians defeat Chelsea 1-0, the 2014 World Cup semi-final between the Netherlands and Argentina, and last year's Champions League Final, as mentioned earlier. John Painting is a contributing writer to the Modern Gooner and the world's fastest dancing robot. You can follow him on Twitter @zorrocat to get down and funky 1001101101.